The Celtics are under .500 straight up and against the spread since the All-Star break, but they are still comfortably in playoff position due to mediocrity in the East. The Celtics are under .500 straight up and against the spread since the All-Star break, but they are still comfortably in playoff position due to mediocrity beyond the top seeds in the East. Boston is a small underdog Wednesday as it looks for a season sweep over the 76ers SU and ATS. The Sixers are -3 with the total listed at 224, according to odds at the Westgate SuperBook. 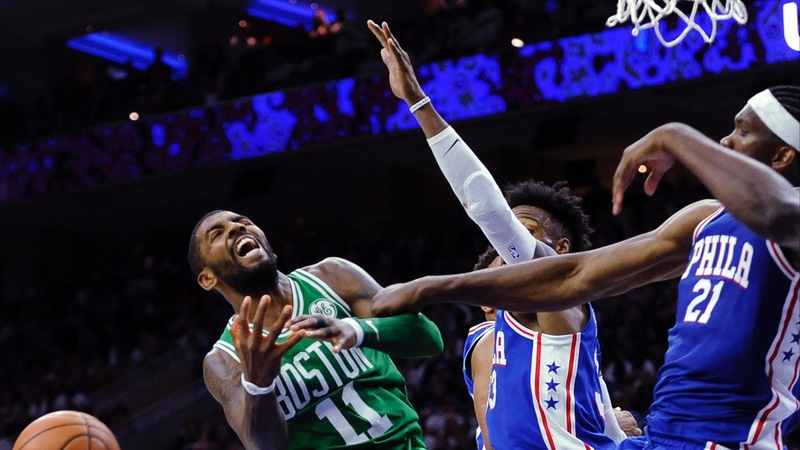 Philadelphia has won seven of its last 10, including five in a row, but has struggled in recent matchups against Boston. The Celtics are 8-2 straight up and ATS in the last 10 meetings between the two Eastern Conference foes. The Sixers return home one night after a win as a short road underdog over the Hornets, 118-114. That sets up the second night of a back-to-back, a situation Philadelphia has struggled in. The Sixers are 3-8 ATS playing with no rest, the second-worst percentage in the league only to the Kings. They fail to cover by an average of 8.8 points per game with no rest, worst in the NBA. In the three games against each other this season, the Celtics have outscored Philadelphia on average 112-103. Gordon Hayward is out with a concussion for the Celtics. He was the team's leading scorer with 26 points in the last game against the 76ers. Joel Embiid will play for the 76ers after sitting out Tuesday against the Hornets. __MORE:__ [Favored Warriors have plenty of issues to overcome before a three-peat](https://www.betchicago.com/warriors-issues-favorites-three-peat) ## Wednesday NBA betting lines, odds, trends *Odds from Westgate SuperBook; all times Central; records from [TeamRankings.com](https://www.teamrankings.com/nba/trends/ats_trends/?sc=all_games)* ### Bucks at Cavaliers odds, 6 p.m. MIL: 53-18, 42-26-3 ATS (best in league), 25-12 SU road (best in league) CLE: 18-53, 34-36-1 ATS __Spread:__ Bucks -9.5 __Total:__ 227 __Moneyline:__ Bucks -600, Cavaliers +425 __Betting tips:__ The Bucks are covering 62.9 percent of the time on the road, the second-best percentage in the NBA. ### Pelicans at Magic odds, 6 p.m. NO: 31-42, 35-37-1 ATS, ORL: 33-38, 36-33-2 ATS, __Spread:__ Magic -7.5 __Total:__ 225.5 __Moneyline:__ Magic -350, Pelicans +275 __Betting tip:__ Pelicans are 1-6 ATS in their last seven games. Magic are 7-2 ATS in their last nine home games. __ALSO SEE:__ [Odds to win Eastern Conference bunched up heading into home stretch](https://www.betchicago.com/nba-title-odds-futures-bucks-raptors-celtics-76ers-4-1-or-less-to-win-east) ### Jazz at Knicks odds, 6:30 p.m. UTA: 41-29, 37-31-2 ATS NYK: 14-57, 29-39-3 ATS __Spread:__ Jazz -12.5 __Total:__ 209 __Moneyline:__ Jazz -1200, Knicks +750 __Betting tip:__ Utah is 4-21 ATS in last 25 games against the Knicks. __Bookmark us:__ [Daily NBA betting coverage](https://www.betchicago.com/nba-betting) ### Wizards at Bulls odds, 7 p.m. WSH: 30-41, 34-37 ATS CHI: 20-52, 32-38-2 ATS __Spread:__ Wizards -3 __Total:__ 230.5 __Moneyline:__ Wizards -155, Bulls +135 __Betting tip:__ Bulls are 12-18 ATS as home underdogs. ### Rockets at Grizzlies odds, 7 p.m. HOU: 45-26, 33-36-2 ATS MEM: 28-42, 32-37-1 ATS __Spread:__ Rockets -5.5 __Total:__ 215.5 __Moneyline:__ Rockets -250, Grizzlies +200 __Betting tip:__ Grizzlies are 9-2 ATS in their last 11 home games. ### Heat at Spurs odds, 7:30 p.m. MIA: 34-36, 38-32 ATS SAS: 42-29, 40-31 ATS __Spread:__ Spurs -6 __Total:__ 210.5 __Moneyline:__ Spurs -275, Heat +225 __Betting tip:__ The Spurs are 24-12 ATS at home, the best home betting record in the NBA. At 22-11 ATS, Miami has the best road betting record in the NBA. ### Raptors at Thunder odds, 8:30 p.m. TOR: 50-21, 30-40-1 ATS OKC: 42-29, 36-35 ATS __Spread:__ Thunder -4.5 __Total:__ 226.5 __Moneyline:__ Thunder -185, Raptors +155 __Betting tip:__ Oklahoma City is 3-12 ATS in its last 15 games. ### Mavs at Blazers odds, 9 p.m. DAL: 28-42, 39-31 ATS POR: 43-27, 40-30 ATS __Spread:__ Blazers -10 __Total:__ 217.5 __Moneyline:__ Blazers -600, Mavs +425 __Betting tip:__ Mavs are 4-11 ATS in last 15 games. Blazers are 10-4 ATS in their last 14 games. __PLAY:__ Our free [Daily NBA Pick 5 game](https://betchicago.chalkline.com/games/nba-pick-5).